RENO (May 28, 2012)—Protect Mustangs has discovered that the Bureau of Land Management (BLM) scheduled an important public hearing for 10 am the morning after Memorial Day weekend without adequately notifying the public. The hearing is scheduled for 10-11 a.m., at the BLM Carson City District Office, 5665 Morgan Mill Road, in Carson City, Nev. The wild horse preservation group is requesting the BLM reschedule the public hearing—regarding the use of helicopters and other motorized vehicles for roundups and management—in order to give the public at least 30 days notice. 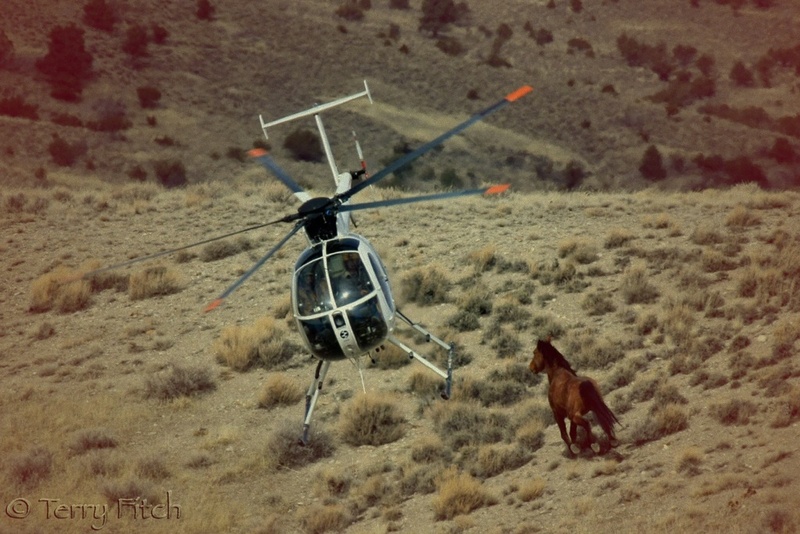 Controversial helicopter roundups have harassed wild horses and burros—stampeding them for miles, often resulting in lameness and sometimes in death. Tomorrow morning, Tuesday, May, 29, 2012. What do citizens have to do to stop a run-away federal agency about to spear a few thousand wild horses a slab?????? Where is our one-reined emergency stop??????????? Why am I not surprised that this rogue agency is once again acting in opposition of the horses? Darn it–my backs out and I’m on muscle relaxants–so driving is out. Darn darn darn. If we can get this rescheduled–I would certainly try to make the drive to support the horses. I tried to post this to fb and they are now censoring me! I’ve noticed this in the last week or so that posts don’t always get to my timeline. Anyone else having issues with fb? Just posted to fb with no trouble. I cannot begin to express my disgust with people who will look you in the eye, smile and say they really care about the horses knowing they are lying through their teeth. That takes practice. Oh no it doesn’t! I won’t name names but I can think of two directors of BLM and the Wild Horses who say one thing outta one side of their mouth and something totally opposite out the other! And my father’s second wifey (who played all of us) was the EXACT same. Dealing with her was easy–you just didn’t mention her name or include her into decisions! Sadly we HAVE to deal with these rattlesnakes! Don’t want insult the donkeys! there is no reason to use helicopters or motorized vehicles and run OUR mustangs into stress and sometimes death.. the colts cannot take it either…. They are OUR horses!!!!!!!! !